As I mentioned in my post about the new yarn stash, I have a plan. The plan is to use the glitzy new yarn in combination with other yarns in my stash and make holiday gifts. I'm thinking of scarves, hats, purses, and maybe shawls or throw pillows. This is the first project on the needles. It's a simple garter stitch scarf. 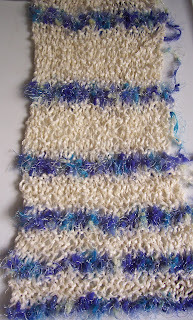 Narrow stripes of blue Bling Bling are paired with stripes of cream chenille which get progressively wider in the center and narrower on the ends. The chenille is quite slippery on size 13 needles, but it has a nice lacy look.